Checking Your Recall Status is Easy. 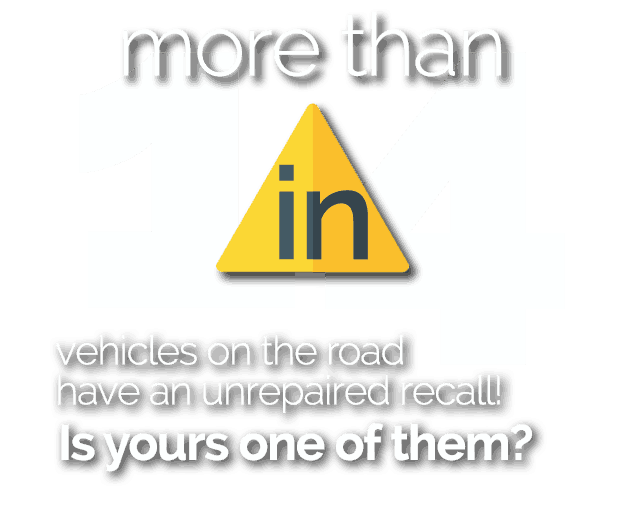 To check your vehicle's recall status, enter your 17-digit Vehicle Identification Number (VIN). Watch the video below to help you locate your vehicles VIN. This convenient tool is made possible thanks to a generous donation from Recall Masters, Inc. the leader in automotive recall solutions. MotorSafety.org can help you determine whether your vehicle is subject to a government-mandated recall or whether there is some factory notice that you should be informed of. Some recalls and notices pose a safety risk to you, while others are not immediately life-threatening. If there is a recall or notice associated with your vehicle identification number (VIN), it’s important to schedule the repair with the local dealership of the same brand as your vehicle. In most instances, these repairs are FREE to the vehicle owner. Ask your dealership if the vehicle is safe to drive to their repair facility. Since recalls and notices are issued frequently, be sure to visit MotorSafety.org in regular intervals to run your VIN again and again. There’s an epidemic of vehicle recalls causing both fear and frustration in consumers across the globe, especially in the United States where more than 1 in 4 vehicles on the road today have an unrepaired recall. That’s why MotorSafety.org was conceived. Comprised of individuals who understand technology, marketing, database mining and the automotive industry, MotorSafety.org’s mission is to remove every unsafe vehicle from the road, facilitate its proper repair, and ensure its prompt return to the owner once these vehicles have met the required safety and performance standards. This is a not-for-profit cause we all have a stake in. Thank you for visiting our website and joining the Recall Revolution! I wasn't even aware that I had a recall but I was able to go to motorsafety.org and discover that I had multiple recalls for my vehicle. I just put in my VIN and all the recalls for my car came up in a easy to read format. I was then able to find the closest dealership near me that could repair my car and get me and my family back safely on the road. The service that motorsafety.org is doing is amazing and should be applauded! My work makes me travel long distances and I like to know that me and my family are safe when traveling. I first discovered motorsafety.org through a friend, who told me how easy it was to check for recalls for my car. To make things even better everything from finding a recall to locating a place to service it, was absolutely free - no strings attached. You guys are doing a great thing for the community keep up the good work! Safer highways aren’t just the responsibility of the vehicle manufacturers. The vast majority of vehicle deaths are caused by drivers. MotorSafety.org wants to remind you to remain alert while operating a vehicle. Be sure to keep your eyes and ears on the road while behind the wheel. And keep those distractions far from curious eyes, especially the phone. Here’s a sobering video from the US Department of Transportation’s National Highway Traffic Safety Administration (NHTSA) to demonstrate the dangers of texting and driving. To learn more about NHTSA, visit safercar.gov.